An experienced Canadian team will begin play Friday against the United States at the 2016 World Mixed Curling Championship in Kazan, Russia. 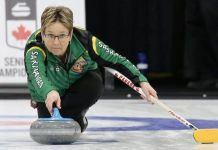 The Edmonton-based team of skip Mick Lizmore, vice-skip Sarah Wilkes, second Brad Thiessen and lead Alison Kotylak will be up against a former Brier participant to open the 37-team World Mixed Friday at 11:30 a.m. ET — Fred Maxie, who played with Calgary’s Ed Lukowich at the 1994 Brier in Red Deer, Alta., is skipping the U.S. side. 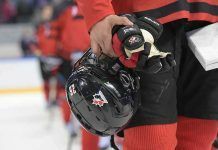 But the Canadian team, which earned this trip to Russia by winning the 2016 Canadian Mixed Championship last season in Toronto, is no stranger to high-level competition as all four players have previously worn the Maple Leaf on the world stage. Both Lizmore and Thiessen were members of Brendan Bottcher’s bronze-medal-winning Canadian team in the 2013 Winter Universiade in Italy, while Wilkes also played in that Universiade as a member of Laura Crocker’s Canadian team. As well, Kotylak won gold as the alternate for Kelsey Rocque’s Canadian team at the 2014 World Junior Championships in Flims, Switzerland. Melissa Soligo will be the Canadian coach. 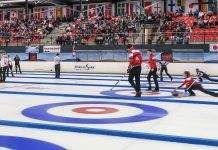 Canada will be looking to improve on its result at the inaugural World Mixed Championship; last year in Berne, Switzerland, Max Kirkpatrick’s team from Swift Current, Sask., was knocked out in the quarter-finals by Russia after going 6-2 in the round robin. The 37 teams competing at the Kazan Sports Palace will be split into five pools; Canada is in Group D with the U.S., France, Latvia, Austria, Belgium, South Korea and Andorra — the latter two countries are making their World Mixed debut. Group A: Defending champion nation Norway, Italy, Scotland, Japan, New Zealand, Belarus and Romania. Group B: 2015 silver-medallists Sweden, Hungary, Finland, Slovakia, Ireland, England and Brazil. Group C: Russia, Denmark, Poland, Czech Republic, Spain, Australia and Kazakhstan. Group E: Germany, Switzerland, Turkey, Estonia, Wales, Slovenia, Netherlands and Croatia. 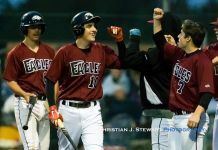 A total of 16 teams will make the playoffs, leading to the gold- and bronze-medal games on Oct. 22 at 7 a.m. ET.